You asked. We listened. Tagging contract metadata in ContractWorks is now even easier with our new In-Viewer Tagging feature. Before In-Viewer Tagging: multiple screens and windows had to be open to tag a contract with the correct metadata. 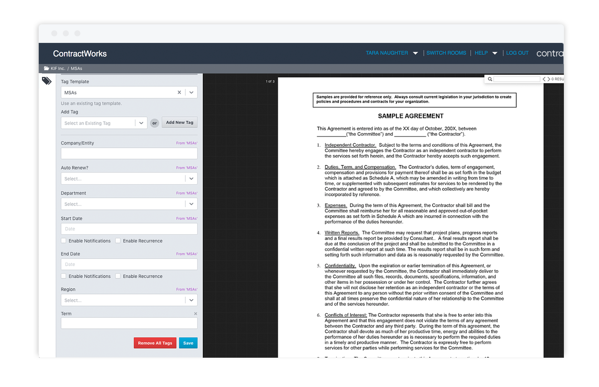 Now: contracts can simply be tagged in the document viewer. One screen, one window, quick document tagging. Simply open up the document of your choice in the ContractWorks' document viewer and select the tag icon in the top left corner. Choose a tag template, fill in the fields, and save. While OCR is already an invaluable tool, by combining ContractWorks OCR functionality with In-Viewer tagging in the document viewer, important contract metadata can be searched for and tagged in minutes. Use the search field in the upper right-hand corner of the document viewer and search for common tags such as dates, terms, and more. The ContractWorks Customer Success Team is standing by to help you learn more about our latest features. If you’d like to learn more about In-Viewer Tagging and how to use it with ContractWorks OCR, attend our next training webinar: Reporting with OCR.